One of the joys of an extended winter break is the opportunity to immerse oneself in reading those books which you feel warrant your fullest attention. Some subjects cry out for that and in Jon Swain’s account of the wars in Vietnam, Laos and Cambodia in the 1960s and 70s, there can be few better reasons. Swain’s journey throughout this period is quite remarkable. A journalist who fell in love with the land, a woman and a life threatening thirst for action, his account of his life during this period is the stuff of legend. He was one of many outstanding reporters and photojournalists of that era, incredibly brave and foolhardy in equal measure, they changed the rules of combat reportage and many, as Swain pays tribute to, paid the ultimate price. What is apparent from the beginning is Swain’s passion for that most illustrious of rivers, The Mekong. A lifeline for tribes, soldiers and people alike, it cuts through the Tibetan Himalayas into Southern China, Laos, throughout Cambodia and eventually in Vietnam before flowing out into the South China Sea. It is a river which played a hugely prominent role in the Vietnam War and the tragic overspill in to Laos and Cambodia. 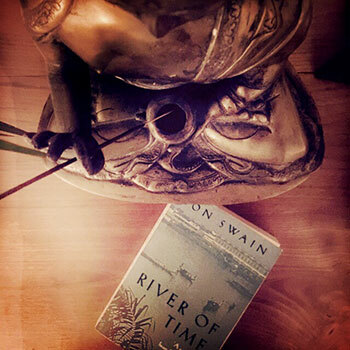 A river which Swain spent a great deal of time living on and exploring and his account of its beauty despite the tragedy of the period is evocative and inspiring. It is part memoir of a man who fell in love with a beautiful woman in the midst of the unfolding horrors of the war in Vietnam, yet despite the sad end to what was clearly a passionate relationship he asks for no pity for that is reserved for the abject misery piled on the millions of innocent victims of a senseless war and a truly awful reign of terror by Cambodia’s Khmer Rouge. The reader can be left in no doubt as to Swain’s disgust at the disgraceful pull out by the American’s at the end of the Vietnam War and the plight of those people abandoned by them in their most desperate hour of need. As he witnessed the fall of Phnom Penh he struggled with the guilt of having left his girlfriend and mother behind in Saigon as the NVA descended upon the city watching the final US helicopters flee their embassy and embattled city. If the pushing away of loyal civilians in those final hours from the American embassy gates wasn’t bad enough the plight of the ‘boat people’ in the months and years to follow would forever tarnish all of civilised society for their lack of support and leadership in the worst mass exodus since the Second World War. Swain’s account of American warships turning away from boatloads of stranded, starving refugees is difficult to read. Stories of the weakest being killed and then eaten to stave off death by starvation beggar belief. How he maintained his sanity during periods of imprisonment, kidnap and ambush is hard to comprehend. He reminds us of the tens of thousands of innocent Cambodians driven into the countryside and their ensuing deaths by the forces of the Khmer Rouge as he stared down the barrel of a gun held by brainwashed child soldiers ransacking the capital as they took over the city. Swain’s relationship with conflict continued after the fall of the Khmer Rouge when he travelled to Ethiopia to cover fighting by newly formed rebel forces along the Eritrean border. It was here that he would shoot to worldwide fame when he was kidnapped and held hostage for three months by fighters from the Tigre People’s Liberation Front. Eventually he was paired with a family from England who had been captured some weeks previously and their kidnapping eventually prompted news reports on the BBC World Service which, when heard by Swain’s captors that he was indeed a journalist and not a spy, secured his release. It is, in many respects a difficult book to read. It does not make for pleasant reading but I felt that the lives of all of those who were killed by forces from all sides of these conflicts deserved to have their stories read forty years later. I for one am glad that I took the time to hear their story.